That lid! 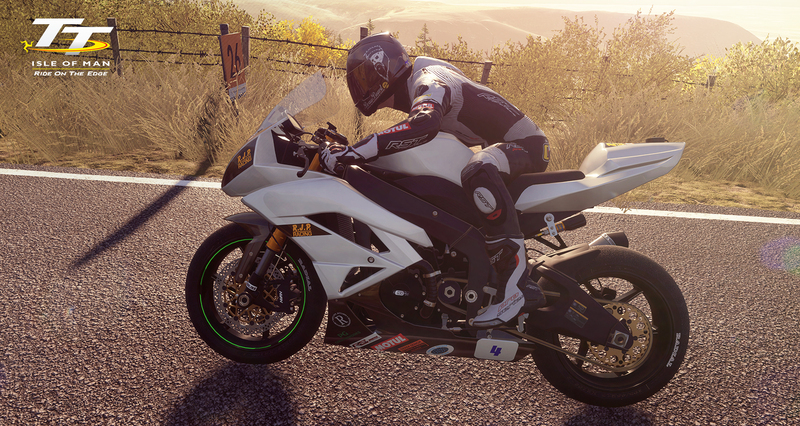 We are so proud to be featured in the Isle of Man TT game, coming out on PS4, Xbox and PC! Braw athlete Jamie Coward will be a playable character in the game which is due for release in March 2018, we can’t wait! After a successful season for Jamie, we are over the moon that he has been recognised and selected to feature, it’s a huge honour. You see, I have a huge emotional connection to the Isle of Man and the TT races. As you may know, most of my family are bikers of some sort. My parents were visiting the Isle of Man for the TT races since turning 16 and getting a bike. They made the annual trip to watch their heroes race on the famous road circuit. Even when my mum was pregnant with me, they were there cheering on the racers from stonewalls and hedges. 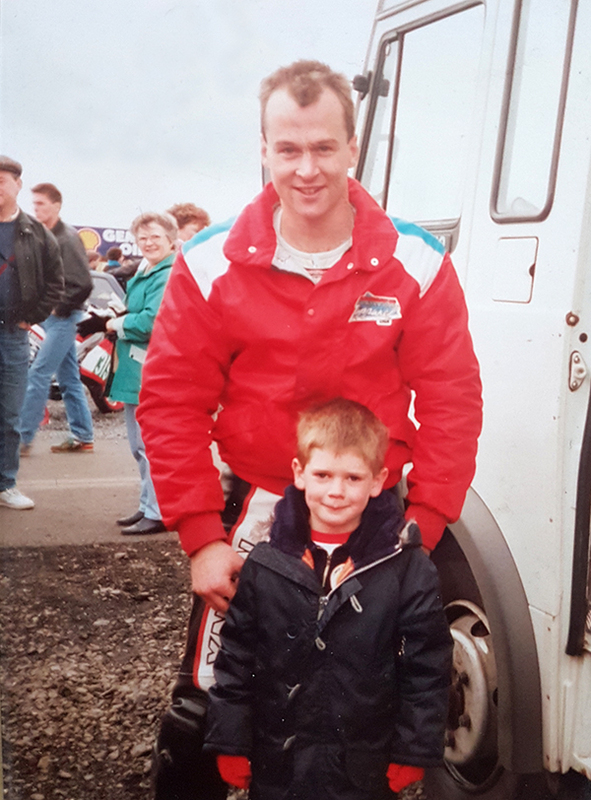 Myself and my childhood hero, Steve Hislop. The Isle of Man would become our holiday destination, usually in the TT fortnight too. Since I was born, I have been there over 25 times, both to visit the island and watch the TT races. It has played a huge role in my life. My mum passed away in 2014, she had 2 requests before she died. 1. That her ashes were scattered on the Isle of Man. 2. Any money collected from her funeral went to the Rob Vine Fund, who are a charity dedicated to providing the best pre-hospital medical and rescue care, equipment and medic training for the Isle of Man’s motorsport events. Both were done just as she wished, her last trip to the Isle of Man was on the back of a motorcycle. Braw Beard and road racing. You may have noticed we sponsor 3 road racers, Jamie Coward, Lee Johnston and Lewis Rollo (who is only 18 and doesn’t have a beard, but you now understand my love for road racing and why I support natural talent). We signed Jamie Coward in 2016 and since then, Jamie has been smashing records and winning more races. Over the winter of 2016/17 he took training and nutrition to the next level and it has paid dividends this season. Getting great results, getting more TV time, interviews and even getting himself in the new Isle of Man TT game!! Check the trailer below. To say we are proud in an understatement, we are already planning the campaign for 2018. 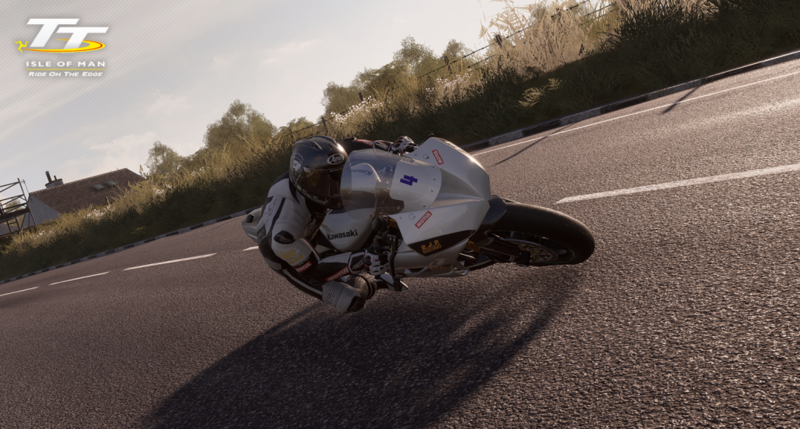 When The Isle of Man TT game comes out in March, we will be doing a giveaway for a copy signed by Jamie himself #staytuned. 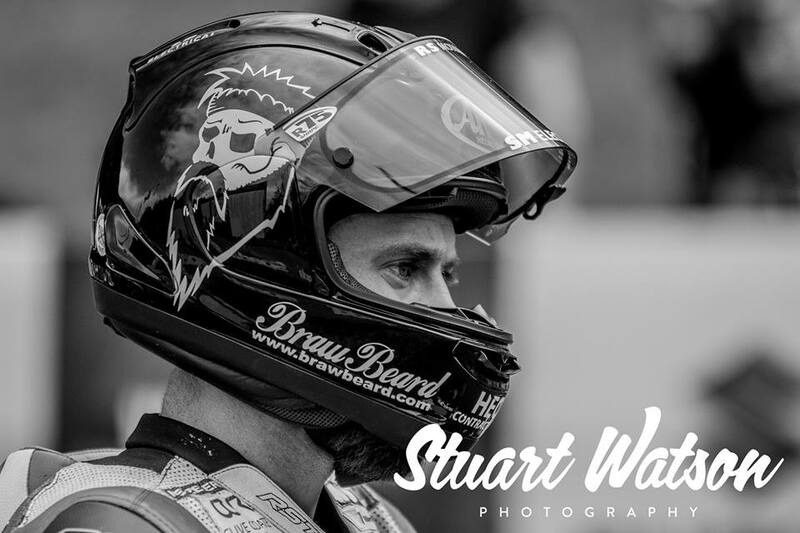 What Braw Beard products do the riders use? Jamie and Lee use the Braw Beard oil and Beard Wash daily to keep their facial hair in prime condition, their beards hit speeds in excess of 200mph, this will strip the natural oils out and pull on the roots. The natural ingredients in our products supplement the natural oils and help repair the damaged hair. In between races, they Braw athletes are using the new Relax and Recovery Bath Salts to recoup. “I used the bath salts at the Ulster Grand Prix after each practice day/race day which helped relax and sooth my muscles, contributing to a great nights sleep” – Jamie Coward, International Road Racer. 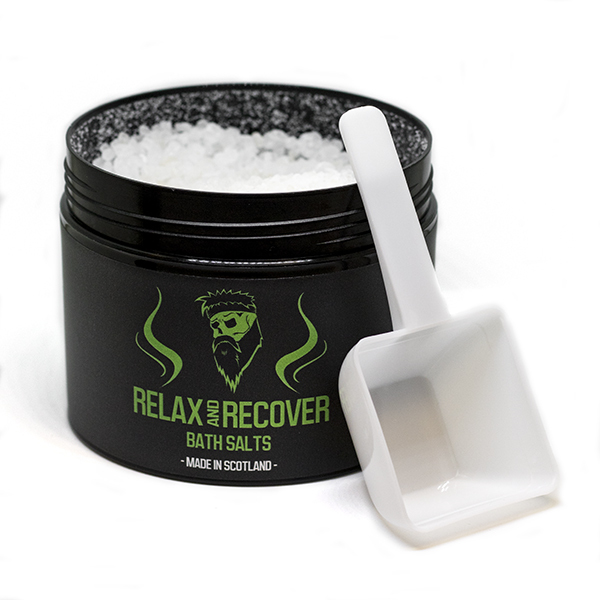 “The Braw Beard Relax & Recovery bath salts helped ease my aching muscles from wrestling the superbike all day. They also helped me get a great night sleep ready for the next days racing. I’ll need to get more because my Mrs keeps stealing them, they smell amazing! !” – Lee Johnston, International Road & BSB Racer. To go from a fan, to now helping racers advance their careers is something I very proud of. 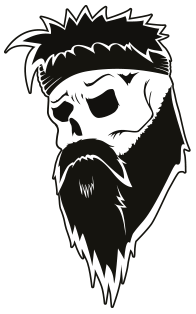 Then to have the Braw Beard logo feature in the Isle of Man TT game is something I could never have imagined. Thank YOU for reading and your continued support. PS. use code – JAMIE15 – for a nice wee discount, it expires Friday 27th Oct at midnight. 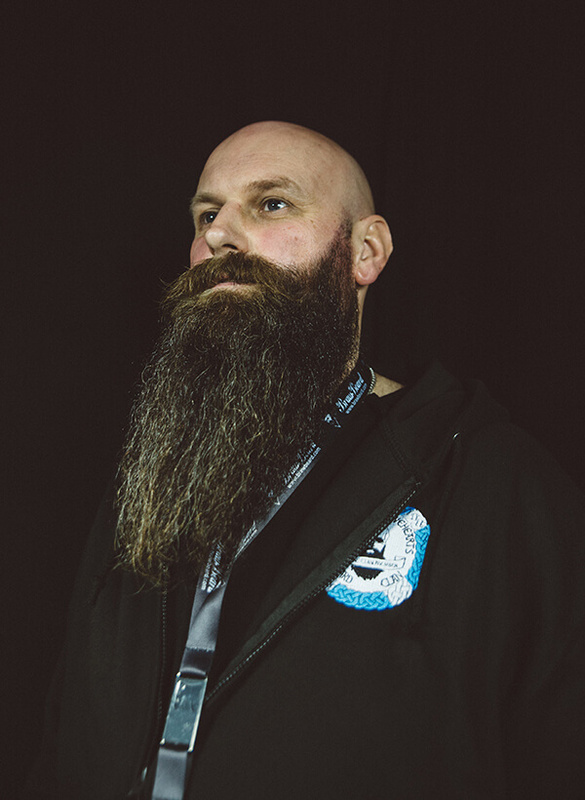 Use code – brawblog – from then on.